Considering past as prologue, Tushnet (Constitutional Law/Georgetown) pursues individual Supreme Court members to analyze their thinking in some significant cases. The Court’s announced positions do not represent neat divisions between such comparative liberals as Ruth Bader Ginsburg and archconservatives like Antonin Scalia, the author finds. Rather, the most important split is between hard-line conservative Republicans—Scalia and Clarence Thomas, for example—and the more traditional Republicans, including Sandra Day O’Connor and David Souter. No wonder the judicial branch has nudged the nation to the right, though perhaps not as far as the Chief Justice might have wished. Tushnet (Making Civil Rights Law, 1994) provides astute reviews of landmark cases dealing with such public concerns as the religious right, gay rights, abortion, affirmative action, free speech, and crime. 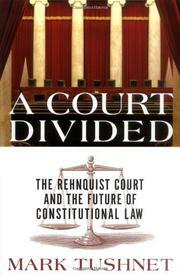 Judging many of the justices in light of the cases upon which they opined, the author sees Clarence Thomas as unwilling to countenance any change in the 1789 Constitution, Kennedy as pompous, Breyer as a bit weird, Ginsburg as family-minded, and Souter as a modern man of the 19th century. Tushnet reserves most of the dissing for Scalia, described as “splenetic” and not “as smart as he thinks he is.” Legal stratagems are explained, the arcana of the law are rendered lucid throughout, and the author’s fly-on-the-wall coverage of the courthouse is quite credible. For the future, Tushnet concludes, we can look forward to more “borking”: that is, to the Senate vetting and ultimately rejecting candidates for places on the bench because of their on-record political convictions. We can also look forward to more politics: decisions based less on settled law, more on the political agenda of the executive branch, as well as on the agenda of the justices themselves. About the only thing left unexplained: those strange gold stripes on the sleeves of the Chief’s robes. An incisive consideration of the Supremes, offering erudite yet accessible clues to legal thinking on the most important level.